Only five minutes into my first day in Vancouver, and I was already regretting my shoes. I wobbled in my stilettos, trying to catch my balance on the Sky Train as I headed north from my hotel. Nervously clutching my bag, I looked around to see if any idle hands were sneaking into people’s pockets. I am not a big-city kind of person, and I was anxious about this big-city internship. I had been awaiting it for months: a chance to intern with NBC Universal at the 2010 Winter Olympics in Vancouver. 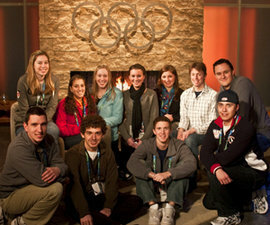 I was one of 31 students to be selected from Ithaca College to work at the Olympics, one of almost 80 interns total. I had never had an internship before, and my lack of experience was unnerving to me. Would I be able to do the job? Could I handle the pressure? Vancouver was astounding -- turn your head south and you see skyscrapers; but turn your head north and there’s mountains and a bay. I certainly made the most of my little free time in the city: going to restaurants in Yaletown with other interns, shopping on Robson Street, taking a bike tour of Stanley Park, and enjoying the wide-open spaces. But I spent most of my time in Vancouver inside, working. Making the great descent into the NBC headquarters, or “the basement,” as the interns called it, there was no light. No windows, no picturesque view. Instead, picture a giant makeshift mouse maze beneath the Vancouver Convention Centre. Wires of all colors and sizes dangled overhead, editors scribbled notes on the unpainted walls, and a studio held one of the largest televisions in the world. Gotta love NBC’s style. I worked with a department called Daily Stories, which was responsible for producing athlete and area profiles. Two tiny offices at each end of the last hallway, stuffed with tape decks and computer monitors, made up the offices I worked for, Edit 10 and Edit 7. I spent most of my days transcribing interviews, creating research packets for reporters such as Tom Brokaw, and selecting shots and music to use in features. One of the research packets I created for Tom Brokaw included an extensive family tree of the Lamoureux family, America’s “hockey family.” Twins Monique and Jocelyn were among the youngest players on Team USA, and researching their family was interesting to say the least. As it turns out, Monique’s got a bit of a temper on the rink (she and other Team USA members got into quite the scrape with Canada’s team during a pre-Olympic game) and the girls were body-checking in the Pee Wee leagues. Our work contributed to the polished broadcasts that Americans tuned into every night for 17 days, but behind the scenes it wasn’t always so pretty. The glamorous world of television was turned inside out for me. I had not imagined the work-filled late nights, the occasional fights, and the scrambling for last-minute projects. With the announcement of Georgian luger Nodar Kumaritashvili’s death on the first day of the Olympics came chaos. People ran down hallways, talking anxiously on cell phones, while executives were locked in a meeting room for hours. The Edit 7 Daily Stories office was in a panic. I didn’t dare enter the office for fear of being trampled or hit with a videotape. While it was a tragic way to start off the Olympics, the spirit of the Games did prevail. With brave performances from athletes like Canadian figure skater Joannie Rochette, who courageously competed just two days after her mother’s unexpected death, Lindsey Vonn’s painful ride to gold, the record-setting performances by Apolo Anton Ohno, and the redemption of alpine skier Bode Miller, athletes and spectators alike joined together to create a sense of hopefulness. I have never seen anything with as great an impact as the Olympic Games on the entire world. Everything seems to stop for the Games, and being able to say that I was a part of it is truly an honor.